There are strange, contradictory claims from the White House on down. Rod Wheeler, a longtime Fox News contributor and private investigator, is suing Fox News over an article published by the network that promoted a baseless conspiracy theory about the murder of former Democratic National Committee staffer Seth Rich. In the suit, first reported by NPR, Wheeler charges that the network fabricated quotes attributed to him that suggested Rich was responsible for providing private DNC emails to WikiLeaks. (There’s no evidence Rich had any contact with WikiLeaks.) Wheeler also claims in the suit that he was told that President Donald Trump pushed to get the since-retracted story published immediately. The White House on Tuesday denied any involvement in the story. That is not true, according to Wheeler’s suit. 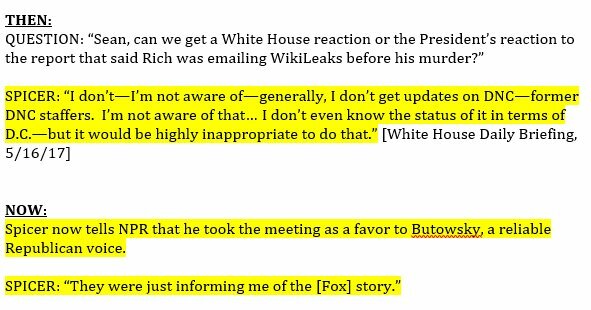 On April 20, Wheeler and Ed Butowsky, the conservative financier funding Wheeler’s investigation of the Rich murder, met with Spicer at the White House to discuss Wheeler’s work. Spicer confirmed to NPR that he took the meeting. That is also false, according to Wheeler’s suit. In March, Butowsky wired $5,000 to Wheeler through a company called “Googie LP,” the complaint alleges. NPR reports that the limited partnership lists Butowsky as its general partner. Wheeler’s attempt to portray himself as a victim of Butowsky and Fox News is dubious. Even if Malia Zimmerman, the story’s reporter who still works as an investigative reporter for Fox News, did attribute fake quotes to him—Fox News said in a statement Tuesday that it has no evidence that she did—Wheeler is far from uninvolved in the conspiracy stories. Wheeler added on camera that a source inside the police department looked him “straight in the eye and said, ‘Rod, we were told to stand down on this case and I can’t share any information with you.’…I don’t think it comes from the chief’s office, but I do believe there is a correlation between the mayor’s office and the DNC and that’s the information that’s gonna come out tomorrow.” The next day, Wheeler said that he actually had no sources and that it was all just a miscommunication between him and the Fox 5 reporter. Wheeler continues to promote outlandish theories about Rich. In June, Wheeler told conspiracy theorists at “Crowdsource the Truth,” a right-wing “truth engine” with a YouTube channel, that he was blocked from looking into Rich’s work for the DNC while he was working as an investigator for the Rich family. He hinted that he might have uncovered something if he’d been allowed to investigate. Five days ago, Wheeler called into a fringe show on FetchYourNews, a local northern Georgia news site, to talk about Imran Awan, an IT worker who was recently fired by Rep. Debbie Wasserman Schultz (D-Fla.) after being arrested on a bank fraud charge. Right-wing news outlets have suggested without evidence that Awan could be WikiLeaks’ source. Roger Stone, a Trump confidante, alleged that Awan and Rich were together on the night Rich was murdered. Wheeler told FetchYourNews he couldn’t discuss Rich because of a cease-and-desist letter issued by the family. “I can’t go into detail with that,” he said. “But, I will say this: Watch this case very closely.” He’s also tweeted cryptically about the conspiracy theory.